Download "Division of Information Technology. Phishing Awareness. 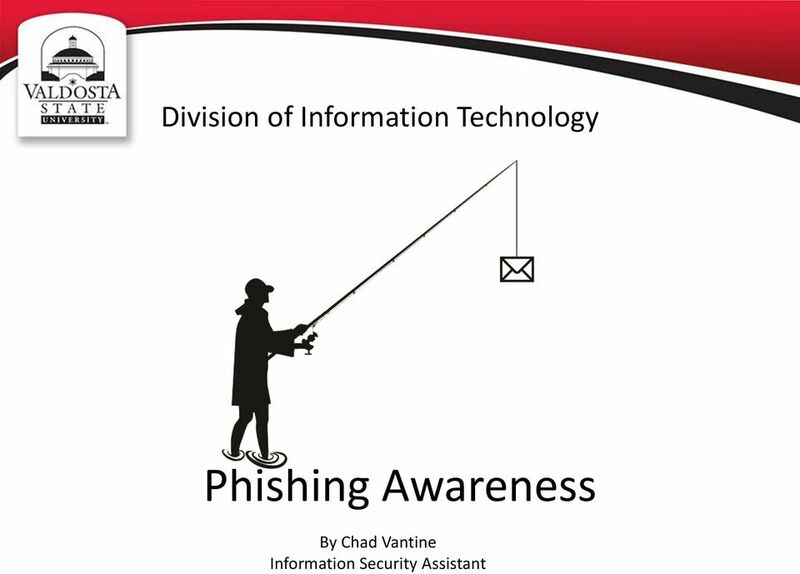 By Chad Vantine Information Security Assistant"
2 What is Phishing? 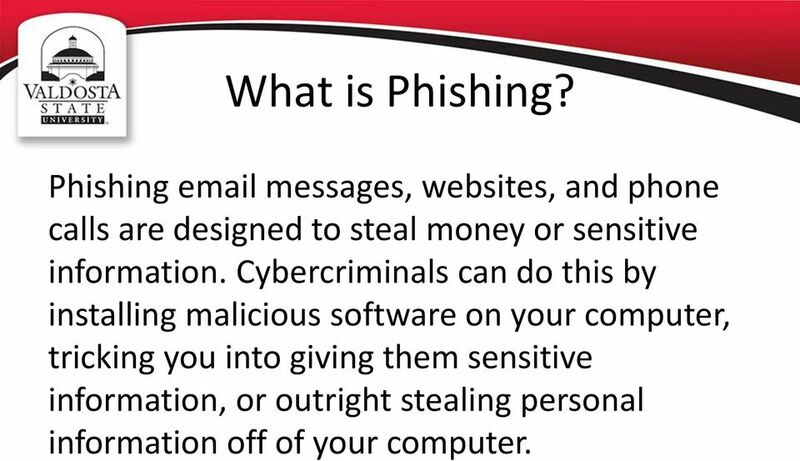 Phishing messages, websites, and phone calls are designed to steal money or sensitive information. Cybercriminals can do this by installing malicious software on your computer, tricking you into giving them sensitive information, or outright stealing personal information off of your computer. 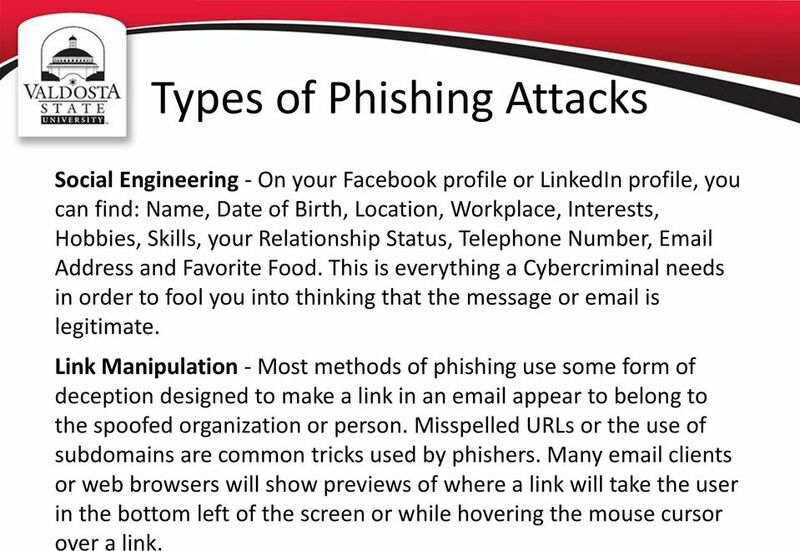 3 Types of Phishing Attacks Social Engineering - On your Facebook profile or LinkedIn profile, you can find: Name, Date of Birth, Location, Workplace, Interests, Hobbies, Skills, your Relationship Status, Telephone Number, Address and Favorite Food. This is everything a Cybercriminal needs in order to fool you into thinking that the message or is legitimate. Link Manipulation - Most methods of phishing use some form of deception designed to make a link in an appear to belong to the spoofed organization or person. Misspelled URLs or the use of subdomains are common tricks used by phishers. Many clients or web browsers will show previews of where a link will take the user in the bottom left of the screen or while hovering the mouse cursor over a link. 4 Types of Phishing Attacks Spear phishing - Phishing attempts directed at specific individuals or companies have been termed spear phishing. Attackers may gather personal information (social engineering) about their targets to increase their probability of success. This technique is, by far, the most successful on the internet today, accounting for 91% of attacks. Clone phishing - A type of phishing attack whereby a legitimate, and previously delivered containing an attachment or link has had its content and recipient address(es) taken and used to create an almost identical or cloned . The attachment or link within the is replaced with a malicious version and then sent from an address spoofed to appear to come from the original sender. 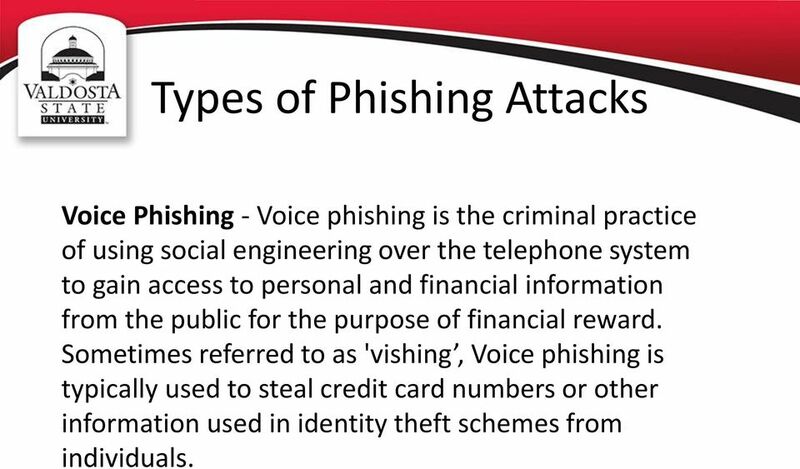 5 Types of Phishing Attacks Voice Phishing - Voice phishing is the criminal practice of using social engineering over the telephone system to gain access to personal and financial information from the public for the purpose of financial reward. Sometimes referred to as 'vishing, Voice phishing is typically used to steal credit card numbers or other information used in identity theft schemes from individuals. 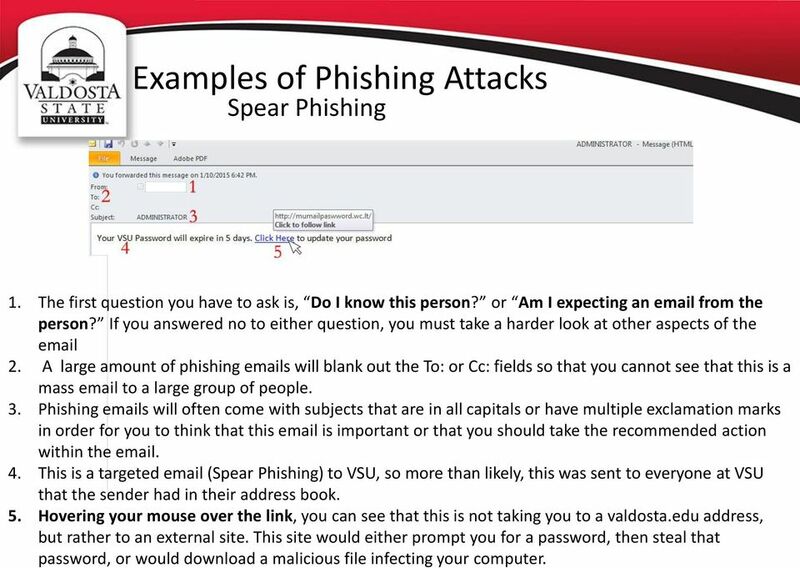 6 Examples of Phishing Attacks Spear Phishing 1. The first question you have to ask is, Do I know this person? or Am I expecting an from the person? If you answered no to either question, you must take a harder look at other aspects of the 2. A large amount of phishing s will blank out the To: or Cc: fields so that you cannot see that this is a mass to a large group of people. 3. 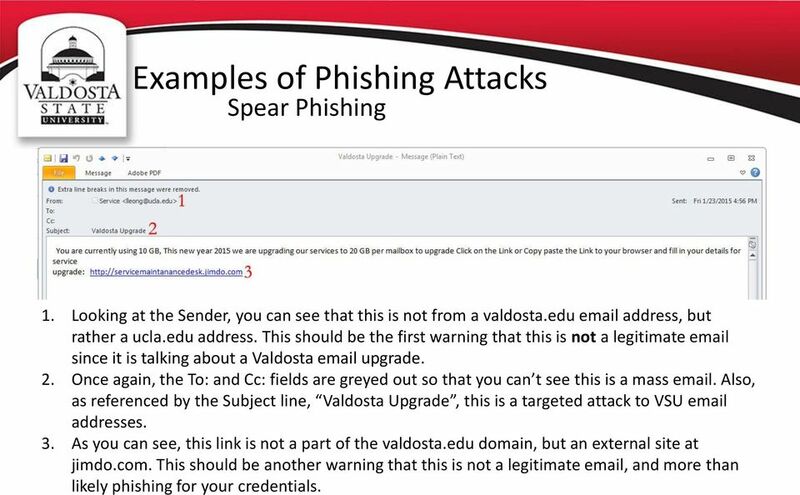 Phishing s will often come with subjects that are in all capitals or have multiple exclamation marks in order for you to think that this is important or that you should take the recommended action within the This is a targeted (Spear Phishing) to VSU, so more than likely, this was sent to everyone at VSU that the sender had in their address book. 5. Hovering your mouse over the link, you can see that this is not taking you to a valdosta.edu address, but rather to an external site. This site would either prompt you for a password, then steal that password, or would download a malicious file infecting your computer. 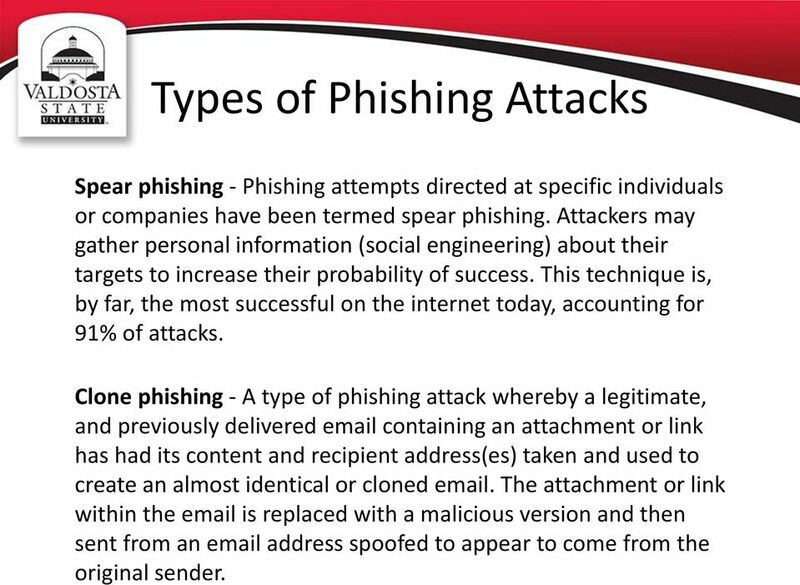 7 Examples of Phishing Attacks Spear Phishing 1. Looking at the Sender, you can see that this is not from a valdosta.edu address, but rather a ucla.edu address. This should be the first warning that this is not a legitimate since it is talking about a Valdosta upgrade. 2. Once again, the To: and Cc: fields are greyed out so that you can t see this is a mass . Also, as referenced by the Subject line, Valdosta Upgrade, this is a targeted attack to VSU addresses. 3. As you can see, this link is not a part of the valdosta.edu domain, but an external site at jimdo.com. This should be another warning that this is not a legitimate , and more than likely phishing for your credentials. 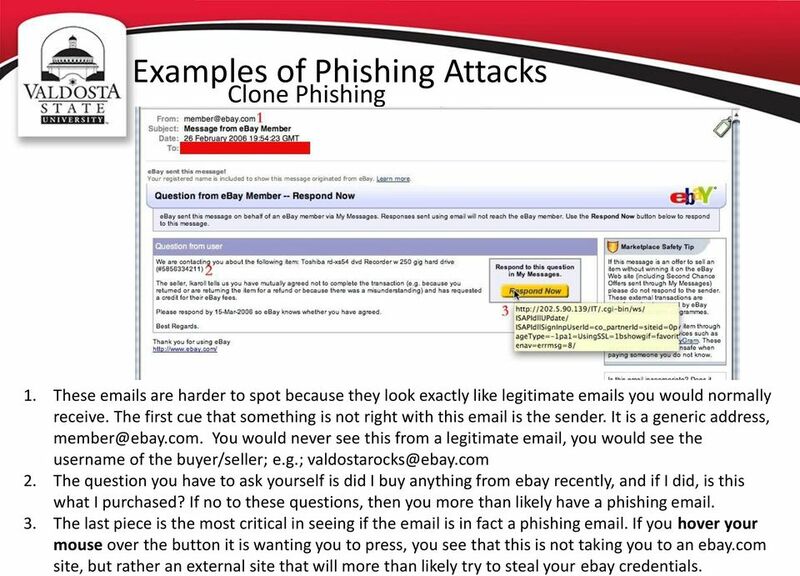 8 Examples of Phishing Attacks Clone Phishing 1. These s are harder to spot because they look exactly like legitimate s you would normally receive. The first cue that something is not right with this is the sender. It is a generic address, You would never see this from a legitimate , you would see the username of the buyer/seller; e.g. ; 2. The question you have to ask yourself is did I buy anything from ebay recently, and if I did, is this what I purchased? If no to these questions, then you more than likely have a phishing The last piece is the most critical in seeing if the is in fact a phishing . If you hover your mouse over the button it is wanting you to press, you see that this is not taking you to an ebay.com site, but rather an external site that will more than likely try to steal your ebay credentials. 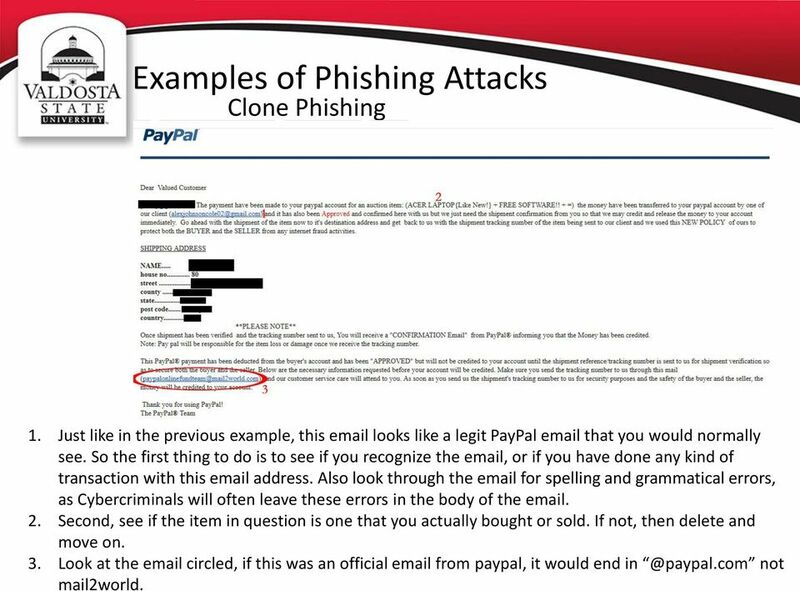 9 Examples of Phishing Attacks Clone Phishing 1. Just like in the previous example, this looks like a legit PayPal that you would normally see. So the first thing to do is to see if you recognize the , or if you have done any kind of transaction with this address. Also look through the for spelling and grammatical errors, as Cybercriminals will often leave these errors in the body of the Second, see if the item in question is one that you actually bought or sold. If not, then delete and move on. 3. Look at the circled, if this was an official from paypal, it would end not mail2world. 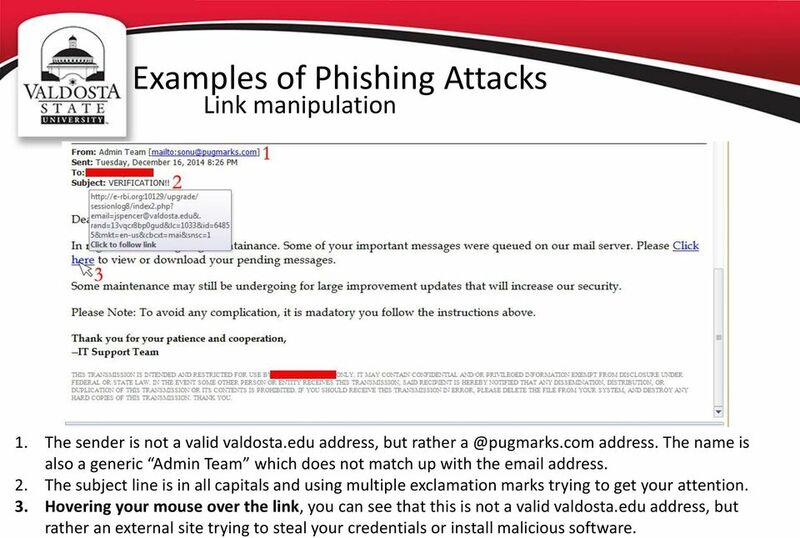 10 Examples of Phishing Attacks Link manipulation 1. 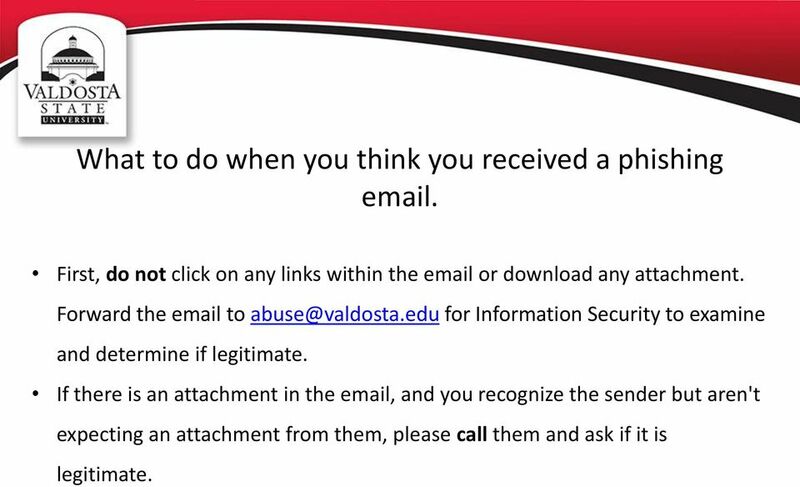 This is actually from a valdosta.edu address, so first you have to ask whether or not this is from someone you know or someone that would be ing you about your account. Remember that only members of I.T. will you about your accounts. 2. One again, cybercriminals will use a subject line trying to get your attention, often using all caps and multiple exclamation marks. A legitimate from I.T. will not do this. 3. The To: and Cc: lines are not shown so that you can t tell this is a mass targeting multiple individuals. 4. 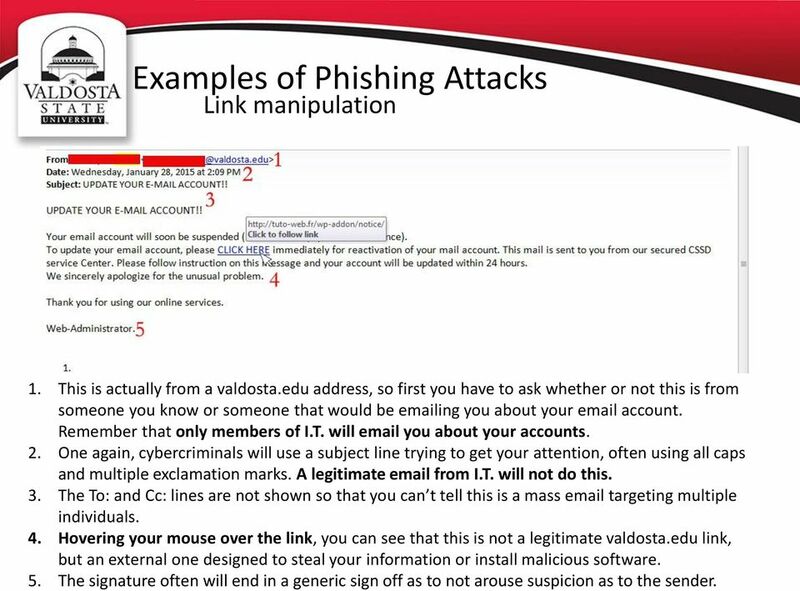 Hovering your mouse over the link, you can see that this is not a legitimate valdosta.edu link, but an external one designed to steal your information or install malicious software. 5. The signature often will end in a generic sign off as to not arouse suspicion as to the sender. 11 Examples of Phishing Attacks Link manipulation 1. 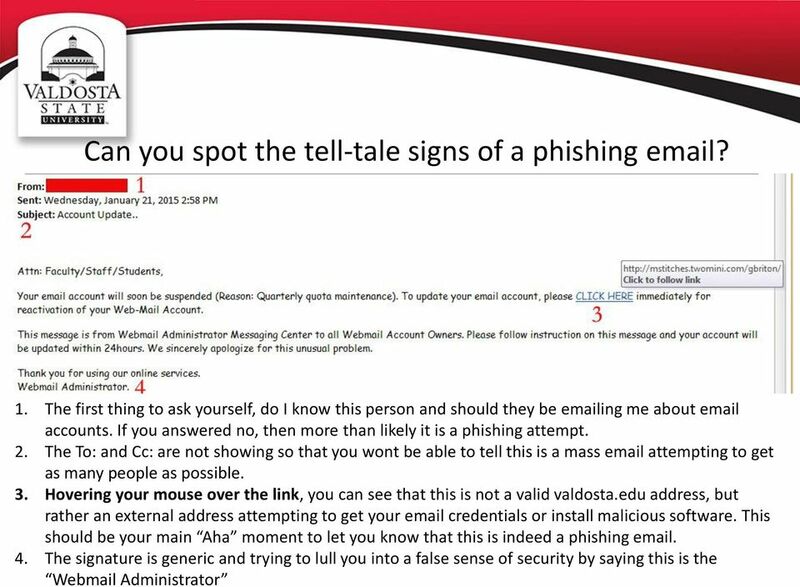 The sender is not a valid valdosta.edu address, but rather address. The name is also a generic Admin Team which does not match up with the address. 2. The subject line is in all capitals and using multiple exclamation marks trying to get your attention. 3. 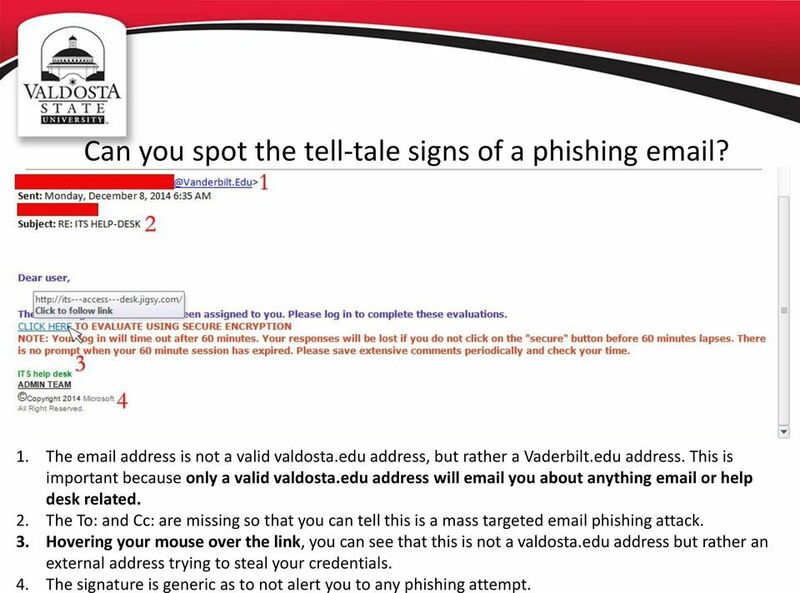 Hovering your mouse over the link, you can see that this is not a valid valdosta.edu address, but rather an external site trying to steal your credentials or install malicious software. 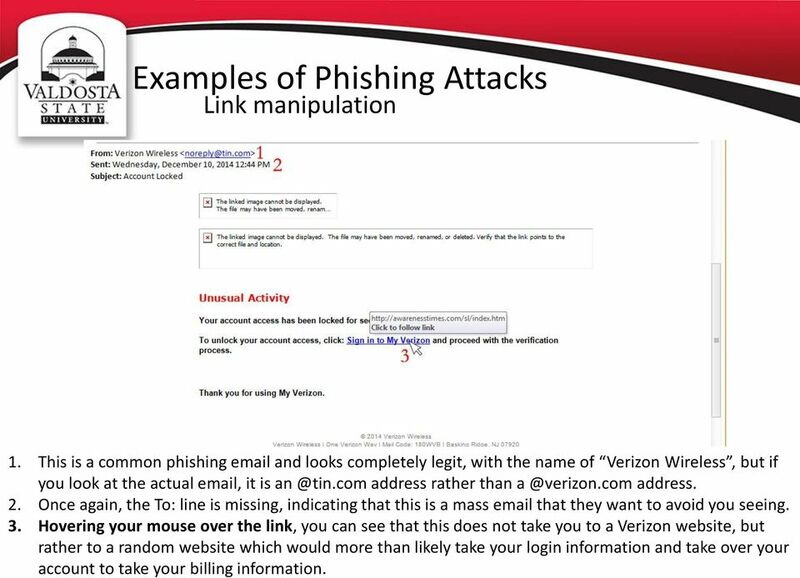 12 Examples of Phishing Attacks Link manipulation 1. This is a common phishing and looks completely legit, with the name of Verizon Wireless, but if you look at the actual , it is address rather than address. 2. Once again, the To: line is missing, indicating that this is a mass that they want to avoid you seeing. 3. Hovering your mouse over the link, you can see that this does not take you to a Verizon website, but rather to a random website which would more than likely take your login information and take over your account to take your billing information. 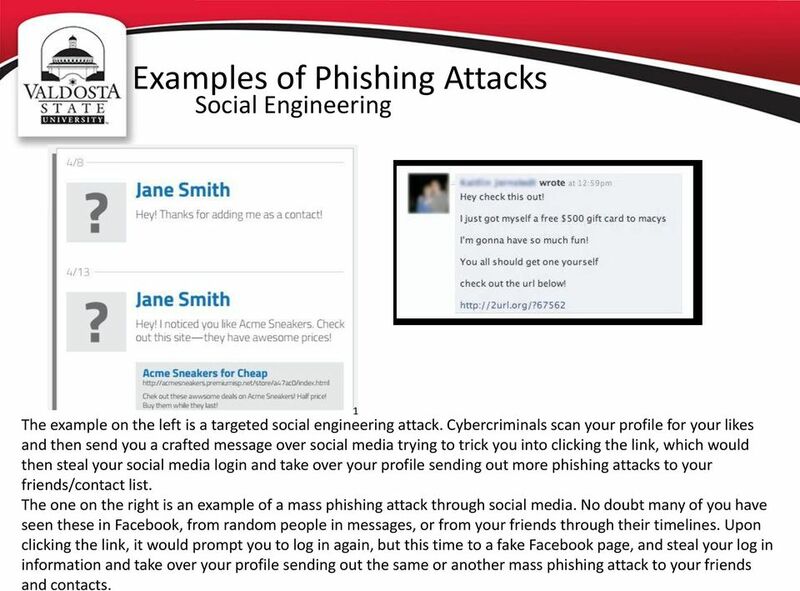 13 Examples of Phishing Attacks Social Engineering 1 The example on the left is a targeted social engineering attack. Cybercriminals scan your profile for your likes and then send you a crafted message over social media trying to trick you into clicking the link, which would then steal your social media login and take over your profile sending out more phishing attacks to your friends/contact list. The one on the right is an example of a mass phishing attack through social media. No doubt many of you have seen these in Facebook, from random people in messages, or from your friends through their timelines. Upon clicking the link, it would prompt you to log in again, but this time to a fake Facebook page, and steal your log in information and take over your profile sending out the same or another mass phishing attack to your friends and contacts. 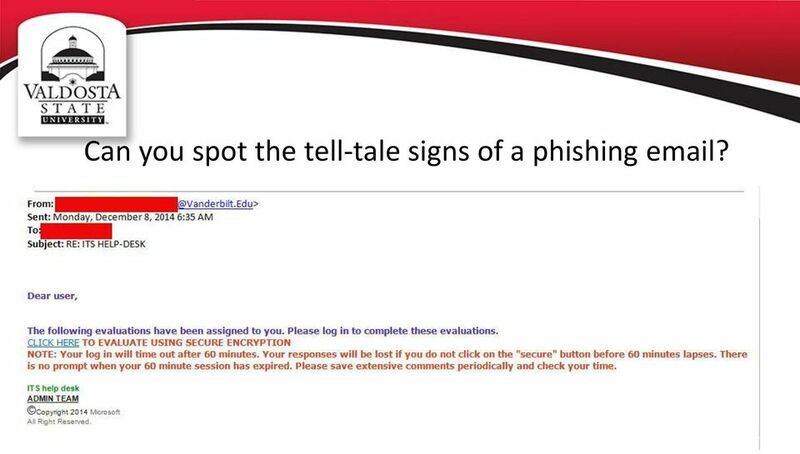 14 Can you spot the tell-tale signs of a phishing ? 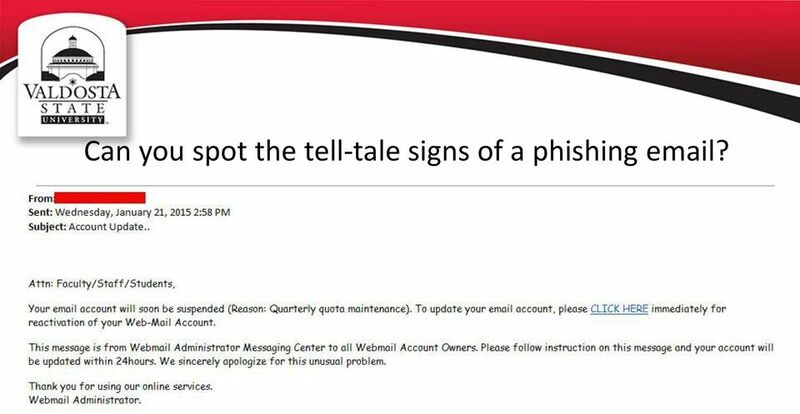 15 Can you spot the tell-tale signs of a phishing ? 1. The address is not a valid valdosta.edu address, but rather a Vaderbilt.edu address. This is important because only a valid valdosta.edu address will you about anything or help desk related. 2. The To: and Cc: are missing so that you can tell this is a mass targeted phishing attack. 3. Hovering your mouse over the link, you can see that this is not a valdosta.edu address but rather an external address trying to steal your credentials. 4. The signature is generic as to not alert you to any phishing attempt. 16 Can you spot the tell-tale signs of a phishing ? 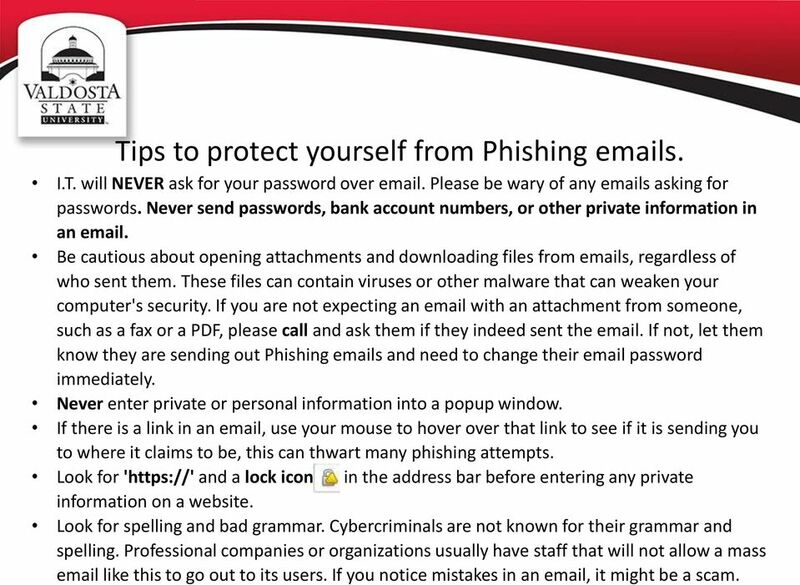 18 Tips to protect yourself from Phishing s. I.T. will NEVER ask for your password over . Please be wary of any s asking for passwords. Never send passwords, bank account numbers, or other private information in an . Be cautious about opening attachments and downloading files from s, regardless of who sent them. These files can contain viruses or other malware that can weaken your computer's security. If you are not expecting an with an attachment from someone, such as a fax or a PDF, please call and ask them if they indeed sent the . If not, let them know they are sending out Phishing s and need to change their password immediately. Never enter private or personal information into a popup window. If there is a link in an , use your mouse to hover over that link to see if it is sending you to where it claims to be, this can thwart many phishing attempts. Look for ' and a lock icon in the address bar before entering any private information on a website. Look for spelling and bad grammar. Cybercriminals are not known for their grammar and spelling. Professional companies or organizations usually have staff that will not allow a mass like this to go out to its users. If you notice mistakes in an , it might be a scam. 19 What to do when you think you received a phishing . First, do not click on any links within the or download any attachment. Forward the to for Information Security to examine and determine if legitimate. If there is an attachment in the , and you recognize the sender but aren't expecting an attachment from them, please call them and ask if it is legitimate. 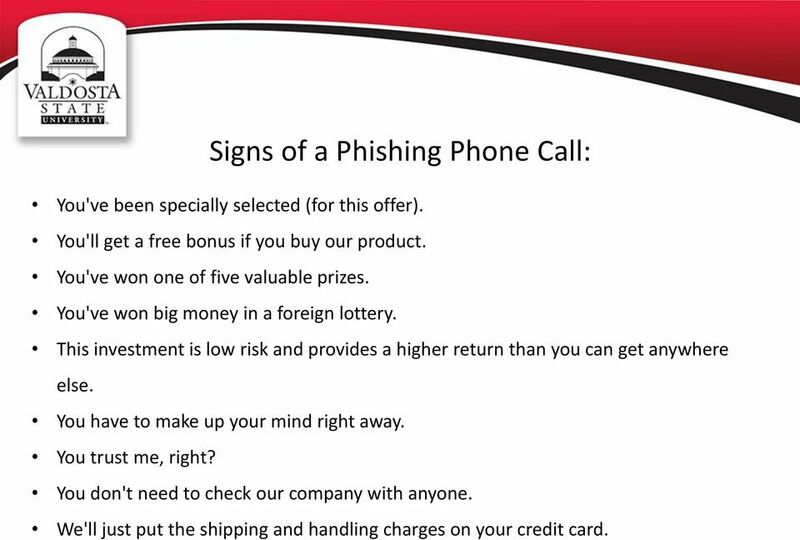 20 Signs of a Phishing Phone Call: You've been specially selected (for this offer). You'll get a free bonus if you buy our product. You've won one of five valuable prizes. You've won big money in a foreign lottery. This investment is low risk and provides a higher return than you can get anywhere else. You have to make up your mind right away. You trust me, right? You don't need to check our company with anyone. We'll just put the shipping and handling charges on your credit card. 21 Tips to protect yourself from Phishing phone calls. Don t buy from an unfamiliar company. Legitimate businesses understand that you want more information about their company and are happy to comply. Always check out unfamiliar companies with your local consumer protection agency, Better Business Bureau, state attorney general, the National Fraud Information Center, or other watchdog groups. Obtain a salesperson s name, business identity, telephone number, street address, mailing address, and business license number before you transact business. Some con artists give out false names, telephone numbers, addresses, and business license numbers. Verify the accuracy of these items. Don t pay for a free prize. If a caller tells you the payment is for taxes, he or she is violating federal law. Never send money or give out personal information such as credit card numbers and expiration dates, bank account numbers, dates of birth, or social security numbers to unfamiliar companies or unknown persons. If you have been victimized once, be wary of persons who call offering to help you recover your losses for a fee paid in advance. 22 What to do if you think you are receiving a Phishing Call Always look up the phone number in Google. Often times, others have received these calls before and will log the number and the type of scam to different websites. Some of the websites are 800notes.com, callercenter.com, and callercomplaints.com. Users will let you know whether or not this is a scam, and what the caller will ask for. Resist pressure to make a decision immediately. Keep your credit card, checking account, or Social Security numbers to yourself. Don't tell them to callers you don't know even if they ask you to confirm this information. That's a trick. Get all information in writing before you agree to buy. Beware of offers to help you recover money you have already lost. Callers that say they are law enforcement officers who will help you get your money back for a fee are scammers. Report any caller who is rude or abusive, even if you already sent them money. They'll want more. Call FTC-HELP or visit ftc.gov/complaint. How can I prevent -based Malware and viruses attacks? Computer Security Self-Test: Questions & Scenarios Rev. Sept 2015 Scenario #1: Your supervisor is very busy and asks you to log into the HR Server using her user-id and password to retrieve some reports. Email Basics. Creating your e-mail. Security guide small businesses and freelancers Security guide 1 1. Introduction 3. The most dangerous types of threats 5. Will you let us protect you? 2. Where is the danger and how can we protect ourselves? Notices. Copyright 2016 Malwarebytes. All rights reserved.